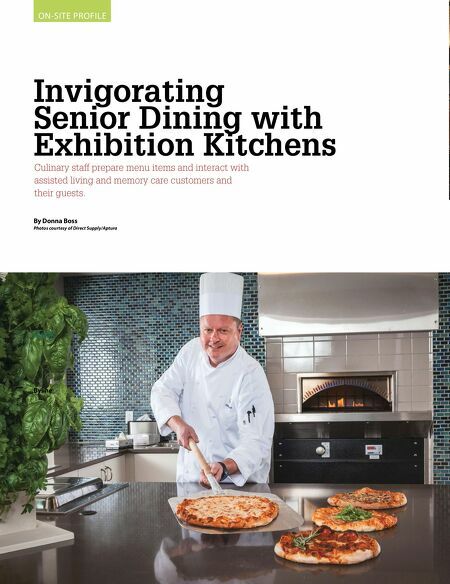 ● ● ● ● ● ● ● ● ● ● ● ● ● ● ● ● SEPTEMBER 2018 • FOODSERVICE EQUIPMENT & SUPPLIES • 59 E xhibition kitchens in the main restaurants bring a welcome enhancement to dining at Harbor Retire- ment Associates' (HRA) establishments. Based in Vero Beach, Fla., HRA is a regional senior living develop- ment and operating company. It focuses primarily on assisted living and memory care communities but also develops and operates independent living and skilled nursing communities. The nine exhibition kitchens, one in Wisconsin at HarborChase of Shorewood and another in Florida at HarborChase of Palm Beach Gardens, serve as a showcase for each community's culinary team. "The kitchens are the culinary hotspot and focal point of our main and private dining restaurants," says Gottfried Ernst, former vice president of hospitality at HRA, who helped develop the exhibition concept. [He left HRA in July 2018.] "It's the place for residents and their guests to watch our culinary team in action, doing what they do best with a la minute and cook-to-order cooking." The exhibition kitchens also feature interactive cooking classes as well as special offerings for private dining such as chef's table themed dinners and carving stations for Sunday brunch and special events. 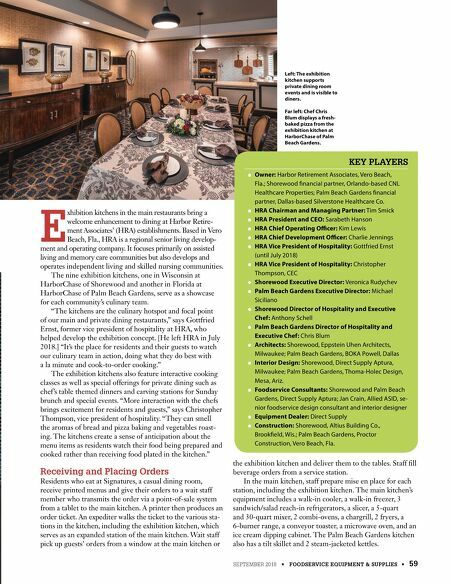 "More interaction with the chefs brings excitement for residents and guests," says Christopher Thompson, vice president of hospitality. "They can smell the aromas of bread and pizza baking and vegetables roast- ing. The kitchens create a sense of anticipation about the menu items as residents watch their food being prepared and cooked rather than receiving food plated in the kitchen." Receiving and Placing Orders Residents who eat at Signatures, a casual dining room, receive printed menus and give their orders to a wait staff member who transmits the order via a point-of-sale system from a tablet to the main kitchen. A printer then produces an order ticket. An expediter walks the ticket to the various sta- tions in the kitchen, including the exhibition kitchen, which serves as an expanded station of the main kitchen. Wait staff pick up guests' orders from a window at the main kitchen or the exhibition kitchen and deliver them to the tables. Staff fill beverage orders from a service station. In the main kitchen, staff prepare mise en place for each station, including the exhibition kitchen. The main kitchen's equipment includes a walk-in cooler, a walk-in freezer, 3 sandwich/salad reach-in refrigerators, a slicer, a 5-quart and 30-quart mixer, 2 combi-ovens, a chargrill, 2 fryers, a 6-burner range, a conveyor toaster, a microwave oven, and an ice cream dipping cabinet. The Palm Beach Gardens kitchen also has a tilt skillet and 2 steam-jacketed kettles. ● Owner: Harbor Retirement Associates, Vero Beach, Fla.; Shorewood financial partner, Orlando-based CNL Healthcare Properties; Palm Beach Gardens financial partner, Dallas-based Silverstone Healthcare Co. ● HRA Chairman and Managing Partner: Tim Smick ● HRA President and CEO: Sarabeth Hanson ● HRA Chief Operating Officer: Kim Lewis ● HRA Chief Development Officer: Charlie Jennings ● HRA Vice President of Hospitality: Gottfried Ernst (until July 2018) ● HRA Vice President of Hospitality: Christopher Thompson, CEC ● Shorewood Executive Director: Veronica Rudychev ● Palm Beach Gardens Executive Director: Michael Siciliano ● Shorewood Director of Hospitality and Executive Chef: Anthony Schell ● Palm Beach Gardens Director of Hospitality and Executive Chef: Chris Blum ● Architects: Shorewood, Eppstein Uhen Architects, Milwaukee; Palm Beach Gardens, BOKA Powell, Dallas ● Interior Design: Shorewood, Direct Supply Aptura, Milwaukee; Palm Beach Gardens, Thoma-Holec Design, Mesa, Ariz. ● Foodservice Consultants: Shorewood and Palm Beach Gardens, Direct Supply Aptura; Jan Crain, Allied ASID, se- nior foodservice design consultant and interior designer ● Equipment Dealer: Direct Supply ● Construction: Shorewood, Altius Building Co., Brookfield, Wis.; Palm Beach Gardens, Proctor Construction, Vero Beach, Fla. KEY PLAYERS Left: The exhibition kitchen supports private dining room events and is visible to diners. Far left: Chef Chris Blum displays a fresh- baked pizza from the exhibition kitchen at HarborChase of Palm Beach Gardens.